Vaccination after Haematopoietic Stem Cell Transplantation (HSCT) is a recommended standard of care. However, prior therapy, immunosuppression and Chronic Graft Versus Host Disease (cGvHD) impacts restoration of immunity and response to vaccination. We investigated the serological response to vaccination with pneumococcal and tetanus vaccines in post-transplant patients. Retrospective analysis was performed on 156 HSCT recipients who survived at least 6 months post-transplantation. Patients were transplanted for all indications from 2004 to 2015. Vaccination was given as per institutional protocol routinely to most HSCT recipients. Vaccine response was defined as an increase in anti-pneumococcal antibody titres from baseline (~6 months) to greater than or equal to 15 mg/L of IgG2 specific pneumococcal antibodies and anti-tetanus toxoid titres greater than 0.1 IU/L. Two-tailed Student T-test was used for continuous variables or Fishers exact test to determine non-random association between two variables. 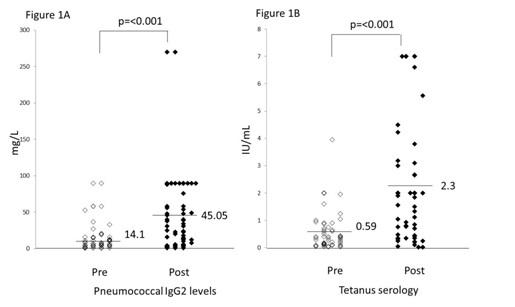 Protective levels of antibodies to pneumococcal and tetanus toxoid antigens were retained prior to vaccination in 20% (n=23 of 114) and 76% (n=82 of 108) respectively. One hundred and twenty-one patients of the cohort (77%) received vaccinations at a median time of 12.16 months post transplantation (range 5.1 to 65.1 months). Of the vaccinated patients, vaccine responses were evaluated in patients with paired serology before and after pneumococcal (n=63, 52%) and tetanus vaccinations (n=57, 47%). Protective levels of antibodies were seen in 39 out of 63 (61.9%) after pneumococcal vaccinations compared with 52 of 57 patients (91.2%) after tetanus vaccination. Poor response to vaccination was seen in patients on a daily dose of 10 mg or more of prednisolone (4 responders out of 12 on steroids versus 35 out of 51 patients not on prednisolone, p=0.04) and chronic GvHD (8 responders out of 26 patients with cGvHD versus 31 out of 37with no evidence of cGvHD, p<0.001). Three patients out of 24 with non-protective pneumococcal antibody levels developed community acquired invasive Streptococcus pneumonia infection compared to none out of 39 patients with protective levels of IgG2 specific Pneumococcal antibodies (p=0.034). In conclusion, at 6 months post-transplant, protective antibody titres to pneumococcal antigens was not maintained post transplantation. In contrast, most patients retained immunity to tetanus antigens. Vaccination appeared effective in most patients where post-vaccination titres were available. Prednisolone and GvHD negatively influenced immune responses to pneumococcal vaccination. Consideration of chemoprophylaxis with penicillin in susceptible, immune suppressed patients with un-protective levels of pneumococcal antibodies is recommended. Allogeneic Hematopoietic Cell Transplantation (HSCT) is a potentially curative immuno-therapeutic strategy used in a range of haematological malignancies. Following HSCT, there is a period of temporary immune deficiency followed by immune reconstitution. The time to immune reconstitution is dependent on the intensity of the conditioning, previous chemotherapy exposure, age at transplant, source of stem cell graft, post-transplant immunosuppression and the development of Graft vs Host Disease [GvHD] [1-3]. Recovery of innate immunity precedes humoral and cell mediated immunity. This may be due to loss of pre-existing memory T-cells, leading to a deficit in the acquired immune response to infections including vaccine preventable infections like tetanus, measles, diphtheria, influenza and pneumococcal pneumonia . Current international guidelines recommend vaccination against common vaccine-preventable infections beginning from 6 months post allogeneic stem cell transplantation . We conducted a retrospective analysis of consecutive recipients of allogeneic HSCT, performed for any indication at Royal Perth Hospital, Western Australia (WA), during the period of 2004 to 2015. Patients who survived at least 6 months post transplantation were included in this study. All patients provided consent for data collection and analysis at the time of transplantation. The transplantation procedures, conditioning regimens, immunosuppression and GvHD prophylaxis/treatment were performed according to standard protocols. Vaccination serology was routinely obtained prior to vaccination at 6 months post-transplantation. Serum antibody levels to pneumococcal antigens and tetanus toxoid were measured at baseline (pre-vaccination) and approximately 6 months post vaccination using an Enzyme Linked Immunoassay (ELISA) method using commercial kit Bindazyme UK MK013 - IgG2 and VaccZyme™ Anti-Tetanus Toxoid IgG Enzyme Immunoassay Kit (The Binding Site UK MK010) testing performed by Immunology Department, PathWest, WA. Peripheral blood flow cytometry was performed to enumerate B-lymphocyte and T-lymphocyte populations using an in-house accredited antibody panel [testing by Haematology Department, PathWest, WA]. The normal range for CD4+ T-lymphocytes was defined as 500-1400 × 106/L, for CD8+ T-lymphocytes was 200-1100 × 106/L and CD19+ B-lymphocytes 100-500 × 106/L. Memory B cell subpopulations are not measured routinely in our centre. Total serum immunoglobulin and IgG subclass levels were quantified using IMMAGE Nephelometry, Beckman-Coulter, [Immunology Department, PathWest, WA]. Streptococcus pneumoniae microbiological culture from blood and sputum was performed if there was clinical suspicion of active infection [Microbiology Department, PathWest, WA]. Vaccines were administered as deep intramuscular injection, at separate sites, after pre-vaccination serology was collected. The vaccination protocol is shown in table 1, and is aligned with EBMT recommendations . Vaccination was administered independent of the serology results. Live vaccination was administered to patients without immunosuppression or evidence of active cGvHD at 2 years post transplantation. Pneumococcal specific antibody titres of IgG2 serotype were collated at two-time points, pre and post vaccination. A sero-conversion response was defined as an increase in more than or equal to 15 mg/L pneumococcal IgG2 levels in a seronegative individual, or after vaccination. Tetanus specific antibody titres were reported with a seroconversion response defined as an increase in levels more than 0.1 IU/mL . All microbiological cultures done for each patient was interrogated via our results database. Positive cultures for S. pneumoniae were collated from sputum, blood or body fluids. Comparison of continuous variables was done using Student T-test. Non-random association between groups was compared using Fisher’s exact test (2-sided). A p-value of less than 0.05 was considered statistically significant. 156 recipients of allogeneic HSCT were identified as eligible to receive vaccination during this study period (2004 to 2015). The patient characteristics of the cohort are listed in table 2. The median age of patients at allogeneic HSCT recipients was 42 years, of these only 4.4% (n=7) were paediatric patients (range from 1.04 to 16 years, median 6.56 years). Most patients received stem cell grafts sourced from peripheral blood (n=126, 80.7%) AML constituted the largest indication for HSCT (n=64, 41.0%), followed by ALL (n=23, 14.7%), MDS (n=15, 9.6%) and NHL (n=14, 8.9%). Median follow up post transplantation was 52.07 months. Of the eligible HSCT recipients (n=156), the rate of post-transplant vaccination was 77% (n=121). Time to vaccination was 7.6 months. A few patients (n=35, 22.4%) did not received any vaccination during the study audit period (Table 3) for the following reasons: Active GvHD (n=16, 10.2%), disease relapse (n=6, 5.8%), relocation (n=3, 1.9%), poor graft function with cytopenias (n=2, 1.3%), and medical reasons (n=1, 0.6%). Data was not available in 7 cases. Protective IgG2 levels of pneumococcal immunoglobulin to pneumococcal antigens was present in 20% (n=23 of 114 evaluable) patients based on serology collected prior to vaccination. Of the 23 patients with protective levels of pneumococcal antibodies at baseline, 19 patients were subsequently vaccinated. Of these 14 received their first vaccination at time of serological testing (n=6) or within 3 months (n=8) while 4 patients had their vaccination delayed between 5 months and 4 years. 16 of these patients had paired pneumococcal serology levels measured and were included in the paired analysis. In contrast, 76% (n=82 of 108 evaluable) patients with baseline pre-vaccination serology titres available had protective levels of tetanus toxoid antibody (>0.1 IU/L).Of the vaccinated patients (n=121), pneumococcal serology was measured pre-vaccination in 80% (n=97) patients. Paired serology measurement was available in 52% (n=63) patients. Only patients with paired serology were suitable for assessment of pneumococcal specific vaccination responses. Paired tetanus serology was available for evaluation in 47% (n=57) patients. Response to pneumococcal vaccination was assessed in 63 patients who received the pneumococcal vaccination and had paired pre and post vaccination serology measurements available. There was a significant increase in the mean pneumococcal IgG2 titres from 14.1 mg/L at baseline to 45.05 mg/L ~6 months post vaccination (p <0.0001), figure 1. However, 38% (n=24) of pneumococcal vaccinated patients did not achieve protective levels of pneumococcal IgG2 titres despite receiving at least one vaccination dose. In detail, 63 patients with paired serology, received at least one dose of pneumococcal vaccination, while 41 and 10 patients received 2 and 3 doses of the pneumococcal vaccination respectively. While inadequate vaccine exposure may contribute to non-development of protective antibodies, we have noted that 10 of 22 recipients of a single dose of pneumococcal vaccination were found to have non-protective levels of pneumococcal antibodies versus 14 of 41 recipients of 2 or more vaccination doses (p=0.41). Poor response to vaccination was seen in patients on a daily dose of 10 mg or more of prednisolone (p=0.04) and chronic GvHD (p<0.001) table 4. We did not observe any significant associations between pneumococcal vaccine response and total serum IgG levels, CD4+ T-lymphocytes, CD8+ T-lymphocytes, CD19+ B-lymphocytes at the time of vaccination or prior anti-CD20 rituximab therapy. Post tetanus vaccination titres were collated. There was a significant increase in the mean anti-tetanus antibody titre after vaccination (0.67 IU/ml versus 2.3 IU/ml, p<0.0001 figure 1B). Overall, protective titres (>0.1 IU/mL) were seen in 94.7% (n=54 of 57 evaluable patients) post vaccination with a median titre of 2 IU/mL (range 0.1 to 270 IU/mL) (figure 1B). Only 5.3% (n=3) of patients did not develop protective tetanus serology. All three patients had GvHD at the time of initial vaccination. In vaccine responders with long term data, sustained immunity to both pneumococcal and tetanus vaccination was seen over 3 years (Figure 2). In our cohort, three patients developed community acquired invasive Streptococcus pneumoniae bacteraemia or pneumonia post transplantation. There was no pattern to the timing of these episodes post transplantation (range 5.9 - 51 months) with one patient developing the infection early (less than 6 months) post transplantation while the other two patients developed infection late post transplantation (Table 5). All three patients presented with fever, cough and clinical features of pneumonia and had non-protective serology levels at the time of infection. They had considerable morbidity needing in hospital admission and intravenous antibiotics. Patient 1 developed pneumonia within the first 6 months post transplantation prior to being vaccinated. He was on cyclosporine as graft versus host disease prophylaxis and previously had been prescribed steroids for acute GvHD. Patient 2 developed S. pneumoniae bacteraemia ~51 months post transplantation requiring an Intensive Care Unit admission with ventilation and ionotropic blood pressure support and a prolonged 55 days inpatient care. He was on Tacrolimus and weaning dose of 5 mg prednisolone daily for GvHD at the time of vaccination and failed to develop protective levels of anti-pneumococcal antibodies post-vaccination. He subsequently refused re-vaccination and was subsequently treated with prophylactic phenoxymethylpenicillin. Patient 3 was on Cyclosporine and prednisolone for GvHD at the time of vaccination and did not develop protective pneumococcal antibody titres. He needed a short stay in hospital after being transferred from a regional hospital. He was discharged on phenoxymethylpenicillin. He was subsequently re-vaccinated and developed protective antibody titres of 26 mg/L. Most allogeneic HSCT patients at our centre received vaccinations as per recommendations of the European Group for Blood and Marrow Transplantation . However, clinicians had discretion to initiate vaccination schedules when they deemed clinically appropriate, leading to a delay in initiation for some patients. For most patients, the decision to vaccinate coincided with immune reconstitution as evidenced by absolute CD4 counts of > 200/μL and/or IgG >5 g/L, in the context of low dose of steroids and minimal evidence of GvHD. In this study, we found a high rate of persistence of protective levels of antibodies to tetanus toxoid at median of 6.57 months post transplantation. There does not appear to be any interaction between immunosuppression, GvHD or transplant conditioning on maintenance of immunity to tetanus. Indeed, in patients with 3 or more anti-tetanus titre measurements (n=6), maintenance of protective antibody titres was seen over 3 years. Other groups have also reported that GvHD had no effect on the response to tetanus vaccination [7,8]. 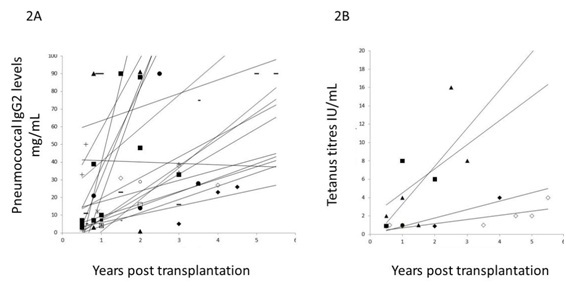 There is evidence that 50% of patients with immunity to tetanus toxoid pre-transplantation maintained their immunity at one-year post transplantation, but that there is a decline in protective antibody titres by 2 years . Hence this data would support the use of routine re-vaccination for tetanus in the post-transplant setting to maintain long-term immunity. In this study, we found protective levels of antibodies to pneumococcal antigens are seen prior to vaccination in 20% of patients tested 6 months post-transplant. We have detected a greater than 3 fold increase in IgG2 specific pneumococcal antibodies from a baseline of 14.1 mg/L to mean of 45.05 mg/L post vaccination. In addition, protective levels of pneumococcal specific IgG2 antibodies are maintained for at least 3 years post vaccination. However, only a small subset of vaccinated patients had longitudinal data available. Hence, further prospective studies may be needed to determine suitable time for re-vaccination in long term survivors post allogeneic transplantation. We have shown that pneumococcal vaccine efficacy is independent of complete restoration of adaptive immunity. We have shown that mean levels of CD4+, CD8+ T cells and CD19+ B cells can be low in patients at the time of vaccination and they can still develop protective levels of pneumococcal antibodies. Similarly, vaccine response was not restricted to patients with levels of immunoglobulin IgG above 4 mg/L and can occur in patients with total serum IgG levels as low as 2.8 mg/L. Hence, vaccination is recommended even when partial reconstitution of adaptive immune response occurs. This is contrast with study done by Cordonnier et al.,  who showed that IgG levels <4 mg/dl negatively affected development of protective Ig levels post vaccination to pneumococcus. Using univariate analysis, the use of corticosteroid therapy and presence of GvHD had a negative impact on development of protective levels of immune response to pneumococcal vaccination. The negative effect of steroids in impairing pneumococcal vaccination response has been previously reported . Similarly, the presence of acute and chronic GvHD adversely affects response to pneumococcal antibody formation after allogeneic HSCT . Hence delay in pneumococcal vaccination would be recommended in patients with active GvHD and on 10 mg or more of prednisolone. In a prospective study of 30 allogeneic HSCT patients from a single centre, vaccination with pneumococcal polysaccharide vaccine 23 valent resulted in a similar median increase in serotype specific IgG response of 43% at one month and 2 months . Antibody titres in this population decrease over time if re-vaccination was not administered . In double cord blood recipients transplanted for malignancy both children and adults developed responses to Prevnar 7 and or Prevnar 13 pneumococcal vaccines . Our group has previously shown that allogeneic HSCT recipients are deficient in switched and IgM memory B cells  irrespective of time post-transplant. Switched memory B cell defects correlated strongly with CD4 T cell count, levels of IgG1 and the presence of GvHD. Other groups have shown that the lack of CD19+ CD27+ memory B cells or decreased levels of circulating immune-globulins make allogeneic HSCT patients susceptible to encapsulated bacteria such as S. pneumoniae and Haemophilus influenzae [15,16]. Therefore, we recommend that B cells subpopulations, including switched and IgM memory B cells, should be measured routinely post-HSCT. In this regard, initiation of vaccination has been recommended to commence 3 to 6 months post transplantation by a few bone marrow transplant and infectious disease societies [3,17,18] and needed 3 vaccination doses of PCV13 followed by a single booster dose of 23 valent Pneumococcal polysaccharide vaccination leads to the development of immune titres across all serotypes included in the vaccination . PCV13, a conjugate vaccine is more immunogenic than polysaccharide PPSV23 vaccine, and confers durable protection and develops an anamnestic response via generation of memory B cells. Twelve of these serotypes plus the 6A serotype not contained in PPSV23 account for >50% of IPD in children and form the basis of the more effective protein conjugated PCV13 vaccine (Prevnar) that was developed originally for young children . Hence, we have adopted a vaccination strategy using conjugate vaccination followed by a single booster vaccination with PPSV23 to cover most strains of S. pneumoniae. S. pneumoniae is a significant cause of vaccine preventable infections which cause considerable morbidity and mortality in immune suppressed HSCT patients. Hence, we reviewed infections caused by S. pneumoniae in our HSCT cohort isolated from blood bronchoscopy washings, blood cultures or sputum cultures. One patient developed pneumococcal infection less than 6 months post transplantation whilst on cyclosporine and prednisone for acute graft versus host disease i.e., prior to our institutions recommendation of vaccinations. Two pneumococcal infections were noted in our cohort after receiving vaccinations, however, both the patients were on immunosuppression for GvHD at the time of vaccination (Table 5). It is unclear whether these cases reflect true “break-through” infection as testing of pneumococcal serotypes was not performed on these cases and vaccination with PCV13 and PPSV23 is not protective against all pathogenic forms. For instance, in a large population based retrospective study of 25,502 patients in Denmark, Harboe et al., has shown that PCV13 covered 55%-80% of invasive pneumococcal infection cases in patients ≥5 years while serotypes included in PPV23 have caused 80%-90% of all IPD cases in elderly patients . In addition, in immune compromised patients with haematological malignancy, PCV13 covered 84% of invasive serotypes while addition of PPSV23 covered 92% of serotypes involved in causing invasive pneumococcal infections . We note an increased incidence of invasive pneumococcus infection in our population as three out of 156 allogeneic HSCT patients (1.92% or 19.2/1000 HSCT patients) which is considerably higher than previously noted. For instance, in a retrospective study, Youssef et al. , demonstrated that the incidence of S. pneumoniae infection was 7 per 1000 HSCTs, (0.7%) with a higher incidence in allogeneic over autologous graft recipients (9 vs. 5 per 1000, respectively; p ≤0.012). This discrepancy may relate to our cohort which includes only allogeneic HSCT recipients. Systemic corticosteroid therapy was also shown to increase the risk of acquiring S. pneumoniae bacteraemia . Engelhard et al. , also showed a significant increase in late invasive pneumococcal infections post allogeneic HSCT compared with autologous transplant recipients (12.2 vs 4.6 per 1000; p<0.01). The rate of S. pneumoniae infection was also significantly increased in patients with GvHD (18.8 vs 8.3 per 1000; p=0.015) . The incidence of invasive pneumococcal infections was 8.23/1000 transplants with a higher incidence of 20.8/1000 transplants in patients with chronic GvHD . This study has a few limitations. Firstly, it is retrospective study with database and medical chart interrogation. Second, the transplanted patient cohort was small and only 50% of the vaccinated patients had paired serology data available. Hence, a prospective study measuring anti pneumococcal specific antibody titres before and after vaccination and assessing infection rates would be useful in validating our observations. The significance of this study is in demonstrating the rapid, early decline in pneumococcal antibody titres in post-transplant patients, with 80% of our cohort having non-protective titres at six months post transplantation leaving them susceptible to invasive pneumococcal infection. Taken together with our response data, we would support clinician discretion to delay pneumococcal vaccination in HSCT recipients with risk factors for non-response including GvHD. However, if vaccination is delayed, alternative prophylaxis (e.g., penicillin) should be used to avoid invasive Streptococcal infection in an unvaccinated patient. Susan Buffery, CNC Bone marrow transplantation nurse and co-ordinator. Ogonek J, Kralj Juric M, Ghimire S, Varanasi PR, Holler E, et al. (2016) Immune reconstitution after allogeneic hematopoietic stem cell transplantation. Front Immunol 7: 507-521. Small TN, Cowan MJ (2011) Immunization of hematopoietic stem cell transplant recipients against vaccine-preventable diseases. Expert Rev Clin Immunol 7: 193-203. Ljungman P, Cordonnier C, Einsele H, Englund J, Machado CM, et al. (2009) Vaccination of hematopoietic cell transplant recipients. Bone Marrow Transplant 44: 521-526. Storek J, Saxon A (1992) Reconstitution of B cell immunity following bone marrow transplantation. Bone Marrow Transplant 9: 395-408. Ljungman P, Engelhard D, de la Cámara R, Einsele H, Locasciulli A, et al. (2005) Vaccination of stem cell transplant recipients: recommendations of the infectious diseases working party of the EBMT. Bone Marrow Transplant 35: 737-746. Schauer U, Stemberg F, Rieger CH, Büttner W, Borte M, et al. (2003) Levels of antibodies specific to tetanus toxoid, Haemophilus influenzae type b, and pneumococcal capsular polysaccharide in healthy children and adults. Clin Diagn Lab Immunol 10: 202-207. Ljungman P, Wiklund-Hammarsten M, Duraj V, Hammarström L, Lönnqvist B, et al. (1990) Response to tetanus toxoid immunization after allogeneic bone marrow transplantation. J Infect Dis 162: 496-500. Parkkali T, Olander RM, Ruutu T, Vuontela K, Volin L, et al. (1997) A randomized comparison between early and late vaccination with tetanus toxoid vaccine after allogeneic BMT. Bone Marrow Transplant 19: 933-938. Cordonnier C, Ljungman P, Juergens C, Maertens J, Selleslag D, et al. (2015) Immunogenicity, safety, and tolerability of 13-valent pneumococcal conjugate vaccine followed by 23-valent pneumococcal polysaccharide vaccine in recipients of allogeneic hematopoietic stem cell transplant aged ≥2 years: An open-label study. Clin Infect Dis 61: 313-323. Winston DJ, Ho WG, Schiffman G, Champlin RE, Feig SA, et al. (1983) Pneumococcal vaccination of recipients of bone marrow transplants. Arch Intern Med 143: 1735-1737. Parkkali T, Ruutu T, Stenvik M, Kuronen T, Käyhty H, et al. (1996) Loss of protective immunity to polio, diphtheria and Haemophilus influenzae type b after allogeneic bone marrow transplantation. APMIS 104: 383-388. Okinaka K, Akeda Y, Kurosawa S, Fuji S, Tajima K, et al. (2017) Pneumococcal polysaccharide vaccination in allogeneic hematopoietic stem cell transplantation recipients: A Prospective single-center study. Microbes Infect 19: 553-559. Cordonnier C, Labopin M, Chesnel V, Ribaud P, De La Camara R, et al. (2009) Randomized study of early versus late immunization with pneumococcal conjugate vaccine after allogeneic stem cell transplantation. Clin Infect Dis 48: 1392-1401. Shah GL, Shune L, Purtill D, Devlin S, Lauer E, et al. (2015) Robust vaccine responses in adult and pediatric cord blood transplantation recipients treated for hematologic malignancies. Biol Blood Marrow Transplant 21: 2160-2166. D'Orsogna LJ, Wright MP, Krueger RG, McKinnon EJ, Buffery SI, et al. (2009) Allogeneic hematopoietic stem cell transplantation recipients have defects of both switched and IgM memory B cells. Biol Blood Marrow Transplant 15: 795-798. Seggewiss R, Einsele H (2010) Immune reconstitution after allogeneic transplantation and expanding options for immunomodulation: An update. Blood 115: 3861-3868. Tomblyn M, Chiller T, Einsele H, Gress R, Sepkowitz K, et al. (2009) Guidelines for preventing infectious complications among hematopoietic cell transplantation recipients: A global perspective. Biol Blood Marrow Transplant 15: 1143-1238. Rubin LG, Levin MJ, Ljungman P, Davies EG, Avery R, et al. (2014) 2013 IDSA clinical practice guideline for vaccination of the immune-compromised host. Clin Infect Dis 58: 309-318. Carpenter P, Englund JA (2016) How I vaccinate blood and marrow transplant recipient. Blood 127: 2824-2832. Harboe ZB, Benfield TL, Valentiner-Branth P, Hjuler T, Lambertsen L, et al. (2010) Temporal trends in invasive pneumococcal disease and pneumococcal serotypes over 7 decades. Clinical Infect Dis 50: 329-337. Debbache K, Varon E, Hicheri Y, Legrand P, Donay JL, et al. (2009) The epidemiology of invasive Streptococcus pneumoniae infections in onco-haematology and haematopoietic stem cell transplant patients in France. Are the serotypes covered by the available anti-pneumococcal vaccines? Clin Microbiol Infect 15: 865-868. Youssef S, Rodriguez G, Rolston KV, Champlin RE, Raad II, et al. (2007) Streptococcus pneumoniae infections in 47 hematopoietic stem cell transplantation recipients: clinical characteristics of infections and vaccine-breakthrough infections, 1989-2005. Medicine (Baltimore) 86: 69-77. Engelhard D, Cordonnier C, Shaw PJ, Parkalli T, Guenther C, et al. (2002) Early and late invasive pneumococcal infection following stem cell transplantation: A european bone marrow transplantation survey. Br J Haematol 117: 444-450. Figure 1: Serological response to vaccination. (A) Increase in Pneumococcal IgG2 levels post vaccination, ◊ pre-vaccination titres (mean level of 14.1 mg/L), ♦ post vaccination titres of 45.05 mg/L. (B) Increase in tetanus specific serology titres post vaccination. ◊ pre-vaccination titres mean of 0.59 IU/mL, ♦ post vaccination titre, mean titres of 2.3 IU/mL. Figure 2: Sustained antibody titres post vaccination in HSCT patients. (A) Serial measures of pneumococcal IgG2 antibodies in 17 patients post transplantation. Protective levels of more than 15 mg/L was maintained over 3 years post vaccination. (B) Preserved protective titres of anti-tetanus antibodies in 6 patients post vaccination. Table 1: Vaccination schedule. Commercially available vaccinations were administered post Haematopoietic Stem Cell Transplantation (HSCT) as per time line. X: time of administration in months (mo) post HSCT. Legend: #: Live vaccination administered if patient did not have active GvHD or immunosuppression at ~2 years post transplantation. Table 2: Cohort characteristics are listed above. Legend: *Other: Hodgkins Lymphoma (n=11), CML (n=12), CLL (n=4), Bone marrow failure syndromes (n=2), Multiple Myeloma (n=2), SAA (n=2), Bone marrow fibrosis (n=2), (account for 5 more left over). Table 3: Indications for non-receipt of vaccinations during study period. Table 4: Effect of baseline immunological and transplant features on response rates to pneumococcal vaccination in assessable patients (n=63). Table 5: Patients with proven Streptococcus pneumoniae infections and patient characteristics. Legend: aAge at time of transplantation, bConditioning myeloablative received Cy/TBI: Cyclophosphamide/Total body irradiation, Bu/Mel: Busulphan/Melphalan, Mel/TBI: Melphalan, cCST - Immunosuppression cyclosporine/tacrolimus and prednisolone, dTitre of pneumococcal IgG2 specific antibody levels, eTime: Time from transplantation, fMorbidity inpatient stay includes tertiary hospital stay, ICU - Intensive care unit stay, RFDS: Royal Flying Doctor Service medical evaluation. Citation: Martin A, Cirillo M, D’Orsogna L, Jack E, Wright M, et al. (2018) Serological Response to Pneumococcal and Tetanus Vaccination after Allogeneic Hematopoietic Stem Cell Transplantation. J Clin Immunol Immunother 4: 011. Copyright: © 2018 Martin A, et al. This is an open-access article distributed under the terms of the Creative Commons Attribution License, which permits unrestricted use, distribution, and reproduction in any medium, provided the original author and source are credited.